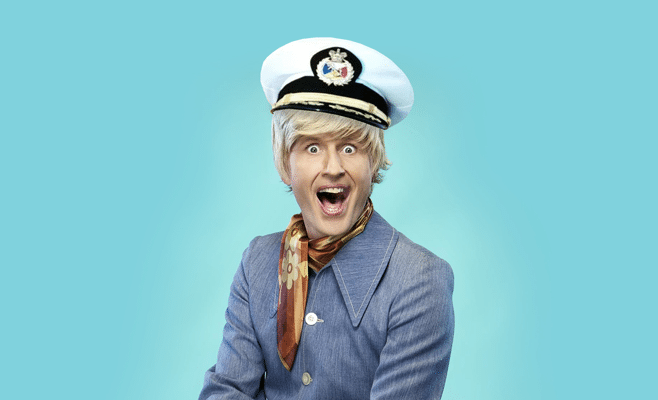 Join Bob Downe, one of Australian most loved and enduring comedy characters for his famous “Love Boat Cruise” – a one man comedy, dance and song extravaganza that includes a scrumptious 3 course meal and amazing views of the Sydney Harbour. Dazzling crowds since 1984, Bob has appeared on many well-loved shows including The Bob Downe Show, The Bob Down Special, Kath & Kim as ‘Darryl’ the menswear salesman, and Kath and Kimderella. He boasts five sellout seasons at the Sydney Opera House, and his 2014 live show Bob Sweat & Tears was a smash hit in Australia and the UK – performing in Sydney, Adelaide, Brisbane, Melbourne, Perth, London, Edinbourgh, and Brisbane alone! Also see our Bob Downe Meets Abba Cruise on 22nd September! Born 4 February 1959 in Melbourne, Mark trained as a journalist at the Herald Sun (Australia’s top selling daily) from 1977-81. He moved to Sydney in 1982 with the success of his cabaret group THE GLOBOS, who enjoyed two National Top 20 singles, ‘Tintarella di Luna’ (1982) and ‘The Beat Goes On’ (1983), along with multiple TV appearances including THE MIKE WALSH SHOW, THE DON LANE SHOW, HEY! HEY! IT’S SATURDAY and COUNTDOWN. Mark created BOB DOWNE in September 1984 at the Glebe Food Fair, and has toured the world as the Prince of Polyester ever since – including a nomination for Best Newcomer at the inaugural Melbourne International Comedy Festival (1987), a Glasgow Mayfest Award (1994), consecutive Melbourne Green Room Awards for Best Cabaret Artiste (1999 & 2000), five sellout Sydney Opera House seasons and 17 Edinburgh Fringe festivals. In 2013 he was presented with another Green Room Award, for Lifetime Achievement in Cabaret. Bob’s 2014 Live show, BOB SWEAT & TEARS, toured Australia and the UK with seasons in Sydney, Adelaide, Melbourne, Perth, London, Edinburgh and Brisbane, and was nominated for FOUR Green Room Awards. Bob’s multiple Television hosting credits include KARAOKE DOKEY (Foxtel, 2007), THE BOB DOWNE SHOW (TV1/Foxtel Australia, 2000-01), FABULOUS, FAMOUS & FORGOTTEN (Network Ten, 2000), BOB DOWNE ALL OVER BRITAIN (BBC/UK Play, 1998), THE BOB DOWNE SPECIAL (ITV UK, 1996), THE ROYAL VARIETY PERFORMANCE (ITV, 1995) and BOB DOWNE UNDER (LWT, 1991). His most recent TV appearances include STUDIO 10 and THE PROJECT (Network Ten, 2014 & 2015) and hosting (for his ninth time) the SYDNEY GAY & LESBIAN MARDI GRAS PARADE (Foxtel/Arena 2010 & Optus webcast, 2012). Since 2002, Mark has established a parallel career singing, acting and broadcasting as himself. His nostalgic documentary/talk series THE WAY WE WERE (ABC TV, 2004) was a ratings winner on Australia’s national broadcaster and he is heard regularly on ABC Radio in Sydney and nationally. Most recently he narrated MEET THE FROCKERS (Foxtel, 2014).